Named after Greensboro businessman John Van Lindley, Lindley Park was developed in 1917 as a residential neighborhood centered around a public park. 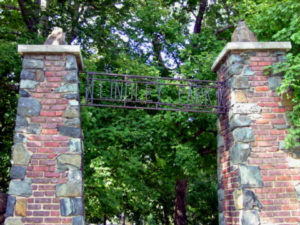 Originally home to an amusement park until 1920, the park’s stone entry gates remain standing at Lindley Park and Spring Garden Street. A neighborhood built on tradition, Lindley Park boasts a thriving neighborhood elementary school of the same name, several churches, a recreation center and public pool, two parks, several locally owned businesses and restaurants, and the Greensboro Arboretum. Lindley Park features Minimal Traditional, Craftsman and restrained Colonial Revival houses as well as Period Cottages and classic bungalows constructed of brick and stone, most built in the 1920s and 1930s. There are also a significant number of simple one-level, brick ranch homes built a little later in the 1950s and 1960s. Homes are flanked by canopy tree-lined streets and two large parks, centered on creeks, span the west end of the neighborhood from north to south. Home prices range from the mid-$100s to mid-$200s. The pedestrian-friendly community includes ample sidewalks with many local businesses. In the heart of Lindley Park is the area known by locals as “the corner,” a small business district located at the corner of Walker Ave. and Elam Ave. “Greensboro’s most colorful corner” features several locally run establishments including Sticks and Stones, Fishbones, Lindley Park Filling Station, Emma Key’s, Bestway Grocery, and Common Grounds Coffee. Neighbors can walk to the corner for a bite to eat or to grab a drink on one of the outdoor, dog-friendly patios. Also each Saturday, the Corner Farmers Market is held in the parking lot of Sticks and Stones, and features local growers, bakers and artists selling their fresh produce, locally raised meat and dairy products, baked goods, and a variety of artwork such as pottery, jewelry, woodwork and textiles. The Lindley Park Neighborhood Association is an active community group with the goal of supporting a vibrant, sustainable, and healthy neighborhood that reflects both the history and potential for Lindley Park. The group hosts several neighborhood events including the annual Spring Fling, the ever-popular Chili Cook-off, and the long tradition of the Lindley Park Luminaries during the holidays. Just click the Apply button to see a full list of homes in the Lindley Park area- to see this search full screen, Click Here!